I have been wanting to make some fabric bean bags for the girls but my sewing machine is currently under a pile that will hopefully become an organized studio space soon. So in the meantime I saw these awesome balloon bean bags on Pinterest (of course) from a great blog called Flipflops and Applesauce. We had all the materials already at home and they took no time at all to make! To make the bean bags you want to begin with regular balloons, we happened to have these dotted ones left over from a birthday party. 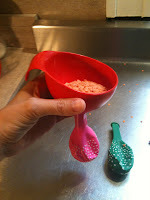 Then using a funnel fill the balloon with any type of small dried beans that you have. We filled some of ours with pinto beans and some with lentils. The Bee helped me scoop the beans into the funnel and thought that was very cool. After the balloon is filled tie off the end. 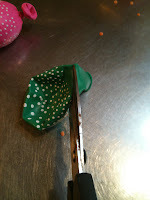 Then take another balloon and use a pair of scissors to cut of the end that you blow into. 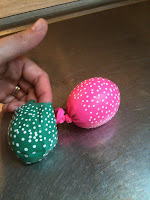 Next take the cut balloon and wrap it around the tied end of the balloon filled with beans. This gives the bean bags a double layer which makes them stronger and prevents curious little ones from trying to untie the balloons. The bean bags also make fun stress balls and the girls have taken to carrying them all around the house. I love how colorful they are and the girls had a great time playing with them. Stay tuned for a post about some of our bean bag games coming soon. Those are ubber clever! Love them. Thanks for sharing. Thanks so much Beth! I will definitely do that! That is so clever. And they look great. Thanks for sharing (found you on Its Playtime). brilliant! ...I can't sow ...and I have not found bean bags in The Netherlands yet...this idea is something I will be able to make. I have all that is needed ...so going to try this tomorrow. Friday Moments- So glad! Please let me know how they turn out! We made these one rainy afternoon, they are awesome, so much fun. This is very awesome post ! your post is very great. Its highly attractive and impressive. I am really searching it many longer.when we was a children every one have done ! Some memorable ever remain ever mind.create a professional email address. Great. I will try this to use in school affected by the earthquake in Nepal. Any other ideas of fillings as cockroaches, mice etc might like the beans. Has anyone used pebbles?